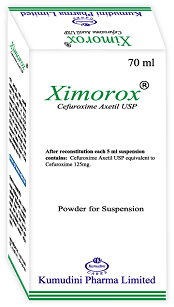 Ximorox 70ml PFS After reconstitution each 5ml contains Cefuroxime Axetil USP eqlivalent to Cefuroxime 125 mg.
Ximorox 250 Tablet Eich film coated tablet contains Cefuroxime Axetil USP equivalenl to Cefuroxime 250 mg.
Ximorox 500 Tablet Eich film coated tablet contains Cefuroxime Axetil USP equivalenl to Cefuroxime 500 mg.
Ximorox contains Cefuroxime Axetil, a broad spectrum cephalosporin antibiotics active against a wide range of Gram positive and Gram negative organisms. It has good stability of bacterial beta lactamase and consequently, is active against many Ampicillin and Amoxycillin resistant strains. Lower respiratory tract infections including acute and chronic bronchitis and pneumonia. Upper respiratory tract infections including otitis media, sinusitis, tonsillitis and pharyngitis. Genito-urinary tract infections including cystitis, ureteritis, pyelonephritis. Skin and soft tissue infections including furunculosis, pyoderma, impetigo. In early lyme disease and subsequent prevention of late lyme disease in adults and children over 13 years old. The absorption of the drug is optimized when taken after meal. Patients with renal impairment or renal dialysis or elderly patients at dosage up to the maximum of 1 g per day need no special precautions. Side effects with Cefuroxime is generally mild & transient in nature. Hypersensitivity reactions include skin rashes, urticaria, pruritus, drug fever, serum sickness etc. Very rarely occurs anaphylaxis. Gastro-intestinal disturbances including diarrhoea, nausea & vomiting are uncommon & occur with higher doses. Headache has also been reported. Treatment with Cefuroxime also report eosinophilia & transient increase of hepatic enzyme levels. Cefuroxime may be given cautiously to patients hypersensitive to penicillins, because cross reactions between Cephalosporin and penicillin have been reported. Special care is required in patients having experience an anaphylactic reaction to penicillins. Prolonged use of Cefuroxime may result in the overgrowth of non-susceptible organisms e.g. Candida, Enterococci, Clostridium difficile. In such case, need interruption of treatment. Cefuroxime is contraindicated in patients with known hypersensitivity to Cephalosporin antibiotics or any inactive ingredient of the product. It is also contraindicated in the patients with pseudomenbranous colitis. Concomitant administration of probenecid with Cefuroxime increase the area under the serum concentration versus time curve by 50%. Drugs that reduce gastric acidity may result Cefuroxime in a lower bioavailability of Cefuroxime compared with that of fasting state and tend to cancel the effect of postprandial absorption. Store Ximorox in a cool & dry place away from light and moisture. Keep out of the reach of children. Keep the bottle tightly closed.